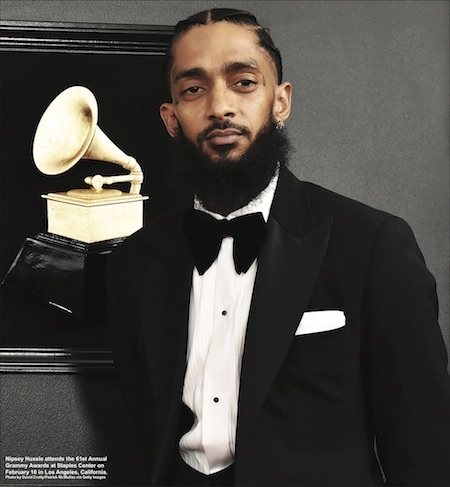 Below is a brief statement from the Honorable Minister Louis Farrakhan on the passing of the gifted artist, entrepreneur and community leader Nipsey Hussle, who was born Ermias Asghedom, lived in and worked to build the Crenshaw section of Los Angeles and who departed this life on March 31, 2019. We are gathering as much information as we can on the passing of our brother Nipsey Hussle. But the Nation of Islam mourns the loss of this great brother. His death as well as his life had so much meaning to it—for us and for unborn generations. We thank Allah that his life came this way from God and touched our lives. I would advise the community not to react to rumors or false information to make us in our time of grief or sadness turn on each other. A bigger hand than the hand of the man who pulled the trigger is behind it all. More will I say in the future. To his family, to those who loved him and have been affected positively by him, we offer to all—peace. The peace that we offer is the Gift of God to those who submit their will to do His will. Best wishes to the family and to all the friends. ‘BUSINESS IS WARFARE’ What is Required for Our Economic Independence?